My husband and I went out to dinner with some friends last week, and they told us about a show they like on PBS called, “Finding your roots“. In the show, they trace people’s lineage back quite far using, documents, family history and DNA analysis. We watched one on Kyra Sedgwick and Kevin Bacon. Kyra found out that she is related to royalty. Would you be surprised if you found out your family was related to royalty? 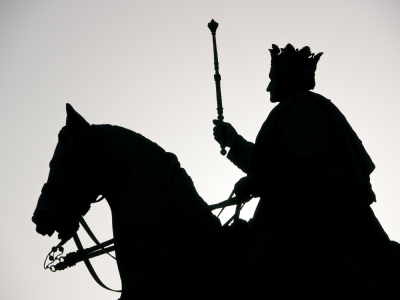 Would you feel more important knowing your 18th great-grandfather was royalty? You’re not just the 18th generation after a king. You’re the adopted sons and daughters of a King, our Lord Jesus Christ. We’re the children of Royalty. What does that mean for us? As adopted children into the family of our God and King, we’re promised eternal life in his palace. We will live with Him forever in paradise. We will know Him. Imagine knowing a King. There are many privileges that come with knowing the King. Our privileges don’t often show up as much on this side of heaven, but our future is secure. We know where we’re going, and that the King has prepared a room for us. We are blessed to be part of His kingdom, and part of the royal family. So many people say that Christians are hypocrites, and I think they’re right. We make big mistakes. We don’t always treat others the way we should. Sometimes we get up on our soapbox or on our high horse and look down at others who don’t know the Lord. What is expected of us as part of God’s royal family? Should we be running around naked, drinking too much and having affairs? That’s how some in a royal family might act, but it’s not what is expected from someone of position. We have a position, and it’s important that we work to reflect our King to the world around us. Not because it gets us into the palace, but because we care so much about the King that we wouldn’t want to tarnish His name. I pray that I am a good reflection of the title Christian. Do you respect your title?